Every baby is unique. Your child will form a caring, loving relationship with their primary caregiver and receive care that is responsive to their individual differences. 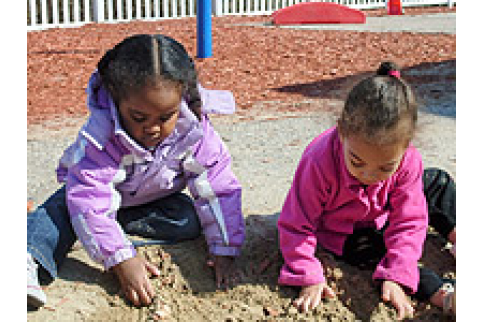 Infants flourish when they are free to explore and when they feel that caring adult encourage and take pleasure in their emerging interests and skills. With the continuity between the home and childcare setting, your infants sense of belonging and ability to understand their world will grow. Infants are exposed to different forms of music, musical instruments, books and tummy time exercises while working on developmental milestones. Tiny Tots is our transition room between the infant and toddler programs. 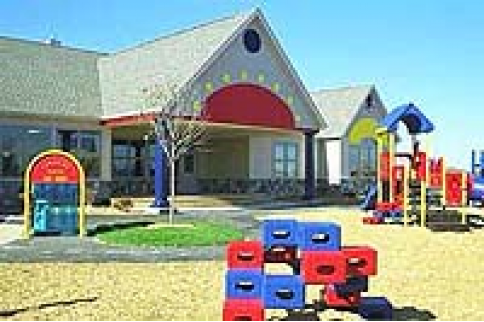 In this room the children have a set schedule that includes 30 minute rotations of circle time, art, musical instruments, buggy rides, outdoor play, learning sign language and much more! There is sufficient continuity of care to ensure that every child is able to form a relationship with a primary teacher. 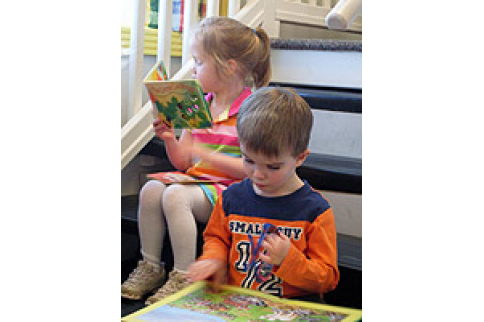 The space is organized into interest or activity areas, including areas for concentrated small-group play, being alone and structured activity. Caregivers work in partnership with the parents with daily communication to build mutual trust and understanding. 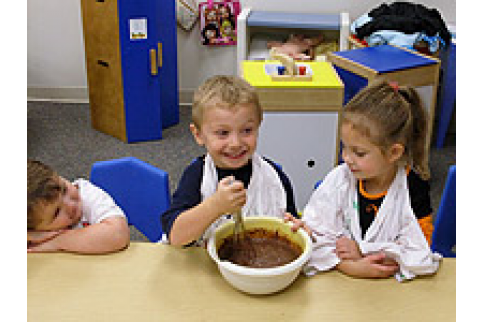 The toddler's environment is prepared in such a way that as the child interacts within it, he or she is prompted towards sensory experiences, experimentation and arrival at conceptual conclusions. The daily schedule provides for alternating periods of quiet and active play and a balance of large and small motor activities. Our staff provides a variety of developmentally appropriate hands on activities to help foster positive self-concept, development of self-help skills, and the toddler's emerging language. Creative expressions and appreciation for the arts are encouraged by the use of music for movement through our tumbling and creative dance classes. All materials and equipment are specially designed for the early preschooler to enhance his/her social and physical development and prepare him/her for preschool. Exposure to a variety of art media and textures helps them to express thoughts and feeling through art they are not yet ready to verbalize. It is at this age that dance and gymnastics is introduced and incorporated into the daily schedule. 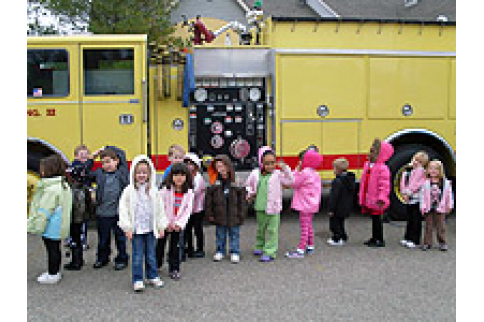 Preschool curriculum focuses on further development of social, emotional and physical skills, and enhances positive behavior as it relates to others. We offer a well-rounded program on the expansion of language skills and basic academics utilizing the arts, music and structured play. Children will participate in a Spring Recital at the Flint U of M Theater at the end of each Preschool year. A child at this age expresses readiness to pursue education by the never-ending question "why". We capitalize on this new enthusiasm for learning as its enhancement is crucial to the overall foundation of a child's self image. The child will work on a Reading Readiness program, using a letter of the week, beginning and ending sounds of the letter, and visual discrimination with left to right activities. They will receive math instructions with hands on manipulatives. In keeping with our well rounded approach to learning, we have incorporated the sciences, nature, cooking, art, computers, portfolios, music, and fine arts classes. Children will also experience a cap and gown graduation at their Spring Recital at the Flint U of M Theater. A fun and challenging adventure for children 5-12 years old! Weekly themes, gymnastics, planned activities, outdoor play and homework support available after school until 6:00 p.m. Full days and half days are available on teacher work days and holidays. Breakfast is available before school and afternoon snacks are provided. Classes are run by our trained professional staff. All play equipment was custom designed and installed to meet or exceed manufacturer's specifications. All equipment is warranted by manufacturer for safety. 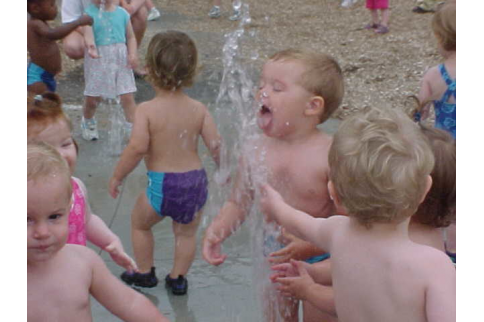 During the summer, all ages excluding infants, participate in "Water Wednesday." Divided play areas for older and younger children - Splash park where children enjoy refreshing cool water that sprays up and squirts up randomly from holes in the play surface and where they can enjoy running under the giant palm tree that showers buckets of water down from overhead bicycle path with custom trike track; there's even a car wash. Ample climbers, sliders, jumpers, and tunnels to promote large motor development and healthy bodies.